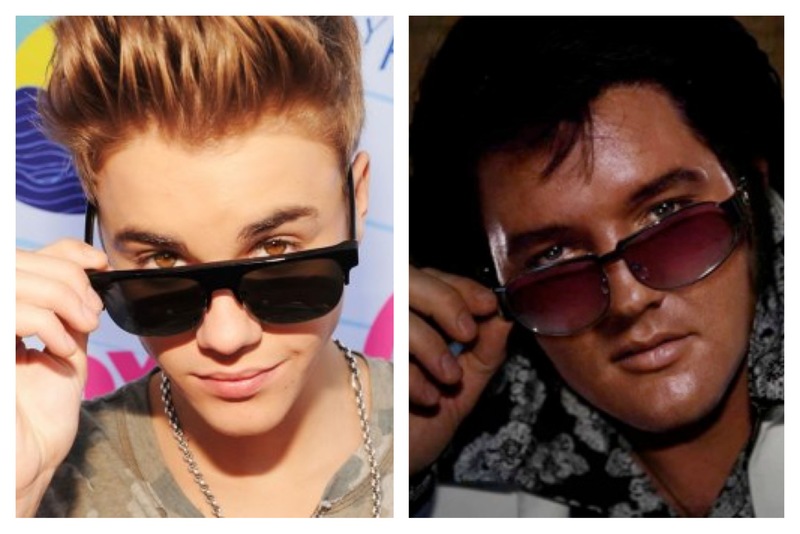 Is pop hero Justin Bieber copying the style of rock legend Elvis Presley? I noticed the Bieber style-change around the time he released his second album “Believe”. The pictures he used on the album and EPs plus the promo pictures. And the more I look – the more I came to think about how much he rips-off the style of the rock legend. 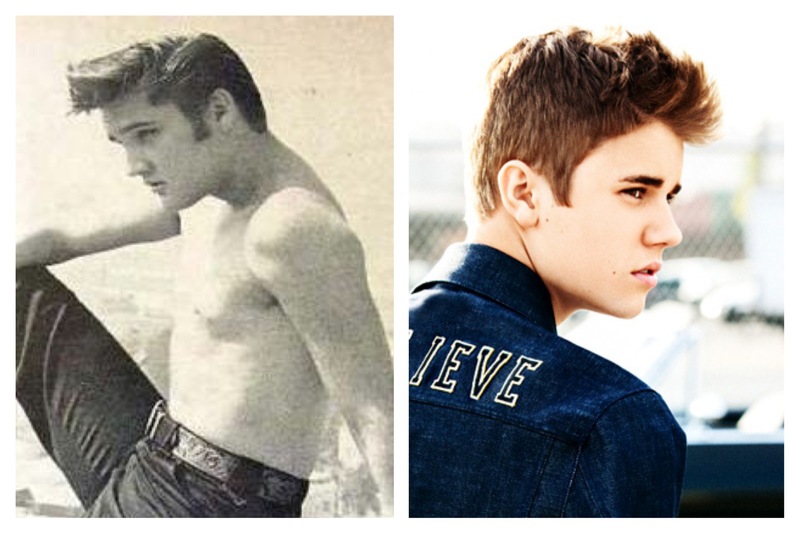 I had to check out if I was turning crazy or if my thoughts about if Justin Bieber borrowing Elvis Presley´s style was true. An hour plus of Googling, finding the right pictures and then a half-hour plus of putting together some photo collages in the app PicFrame – and here´s the result. 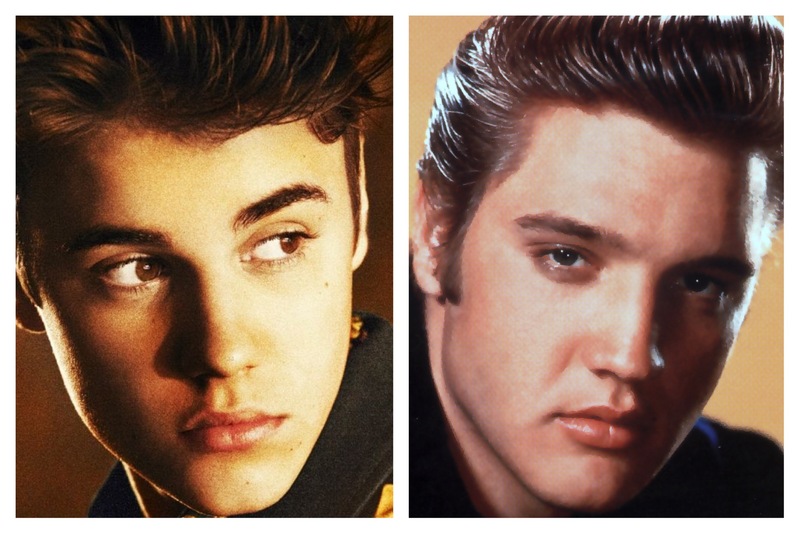 I mean there is more than a little likeness between Elvis and Justin here – what do you think? I find it quite cool to see the latest years biggest teenage crush, daring to borrow and find inspiration from the biggest teenage crush – and later biggest rock star in the world – of the 50s, 60s and 70s. It´s quite fascinating. A young man not even 20 years old – finding inspiration from a man, that was born almost 60 years before and died almost 20 years before he (Justin) was born! 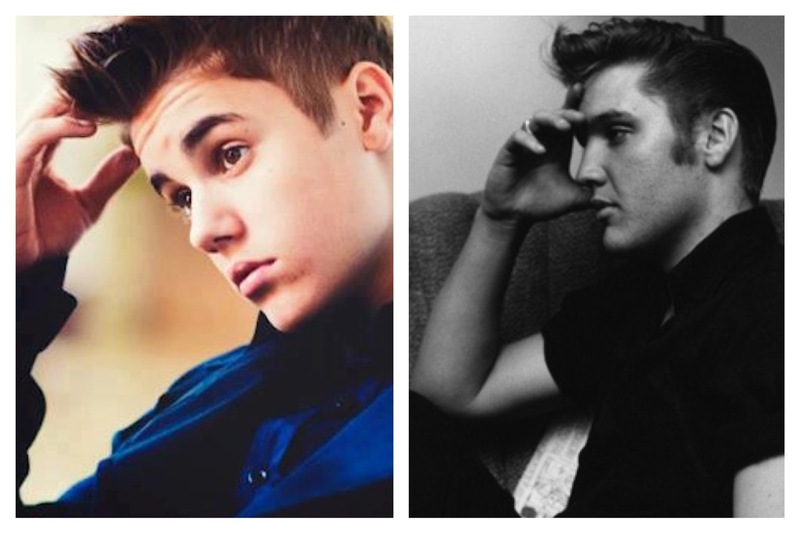 Here´s Justin Bieber vs Elvis Presley – or – Elvis Bieber vs Justin Presley if you like? 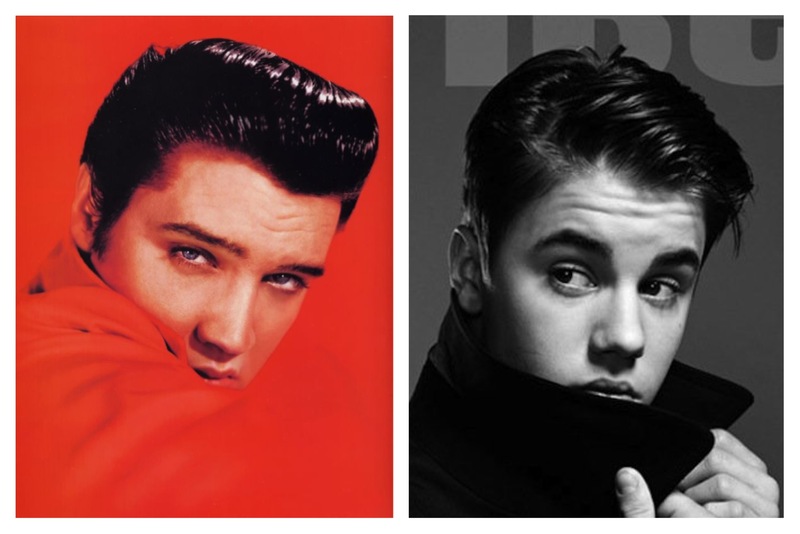 Do you think Justin Bieber is copying Elvis Presley? Is Justin a look-a-like or a rip-off of Elvis´style? Give me your feedback – do you see the likeness? Without Elvis there would be no Beiber, or any other rock stars. And without the blues there would have been no Elvis. So Elvis was a follower and a leader, Beiber is just a follower. Elvis emulated artist like Tobert Jordan, chuck berry n many other real blues artist. Don’t get me wrong like Elvis, but even many rockers like the Tolling stones hive homage to Robert Jordan and many other original blues artist, so blues would have continued to exist without Elvis. Elvis was the original, without Elvis there would have been no rock stars. Without the blues there would have been no Elvis. Beiber is just a copycat wannabee. Not a fan of Bieber myself, more of a Elvis-kinda-guy! But i think JBs not a Elvis wannabe. He must do something right, because about almost all rappers out there wants to and/or works with him. I can understand the hysteria – but it´s nothing for me. Elvis, Beatles, Michael Jackson +++ all had hysteric fans. So who knows – maybe we all accept JB as he gets older? Look at other childcrushes like the older Justin – Timberlake that is. One of the biggest stars in the world today! Good theres space for everyone out there! Sorry to bother you, but one of the comments I made on your page, about Elvis vs Justin, has published my email address by mistake, I don’t mind my other comments being on your page, but if you couuld please delete the comment that has my email address published, I would be grateful, thank you. About your comment with out Elvis there would be no rock stars, some people may of called Elvis the king, Elvis did not start rock n roll, it was African American artist that layed the foundations for rock n roll before he came along, Elvis admitted his music had it roots in the black comunity at that time, so how he the first ? Elvis was and still is one of the best singers and entertainers in show-biz! A legend! Sorry, pardon my grammar, I meant to say how is Elvis the original, when early rock n roll came about before he did, I don’t mind Elvis, he may of been the king of rock n roll, but he was not the first. But you can’t deny he is a legend – make sure to check out his last recordings. They’re classic! Yes, Elvis was a great rock n roll legend, there will only be one Elvis, he was unique. Yes, Elvis was a legend, and there will only be one Elvis, he was unique. Forgot to mention, good job on tracking down the photo comparisons, that must have taken a while. Good reporting. .
Nice work! There is a resemblance. Although I’m not sure if it is the result of a very intelligent marketing campaign or purely the amount of pictures that exist between the two. Some is resemblance i guess, others is just the same pose. I had fun doing the collages and i liked do a loose and tiny blogpost, not to serious. But will never reach his league. If so happens – i´m surprised. But people said that about Elvis and Beatles in the start of their career! JB will never come close to Elvis. To sum it up JB has sold 30 Million. Elvis sold 75 million within his first 5 years. Elvis had 15 number 1s in his first 5 years. JB had 1. Adults and kids loved and still do love Elvis. Only kids like JB. He soon will be forgotten in 5 years, just like all the teen pops stars are from the 90s. I agree, i don´t think he´ll ever get the status as Elvis, but seening the hysteria – theres no doubt JB´s the Michael Jackson for the ´00 generation! Not being a big fan myself, but I kid who´s a Belieber. It´s kinda exciting to see if he manages to have a career – lets say – 10years from now! Thanks for your reply Ryan! It’s much better than that mushroom bowl cut he used to sport — but of course there is only ONE Elvis and JB doesn’t even come close. If anything, I think Adam Lambert kinda resembles Elvis. And I agree with the previous poster, great research finding all those photos, pretty cool! Thank you for great reply Maryanne! It´s quite fun doing the research. Have a super thursday! It would appear that maybe the bubble is bursting and the Bieb will be more known more inane comments in historic guest-books and speeding in flashy fast car in residential areas and on freeways. He could be heading down Lindsay Lohan Lane. It’s true Elvis was infatuated with flashy cars, but he was more known for buying them for other people, not speeding. I guess he had better handlers/publicists than the Bieb. Or maybe he took more notice of them. I don’t recall any bad publicity from Elvis back in the day other than the conservative squares who objected to that “awful rock n roll” and the hip swiveling. But that was America in the 50’s a whole heap of “right wing anxiety”, oops no change. But really Justin needs to listen to his handlers, put on a shirt, pull up his pants and slow down in the Ferrari. Being not a JB fan myself, but growing up with kids who are, it´s kinda amazing to see how the kids embrace Bieber. It´s some sorta hysteria Michael Jackson was going through. Hope JB – for his own sake – has a strong and great team around him, that protects him. I´m agreeing with many of your points as you can see Barrie! I did this thing just for fun. 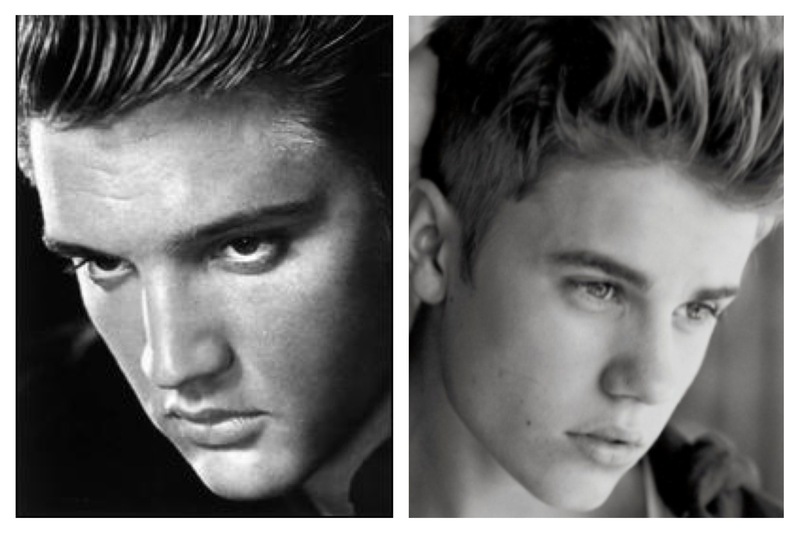 Having a kid who loves Justin, i struck me how much alikeness there is between the to heroes, Elvis and Justin. I guess Justin Bieber has come to stay. And has a long future career. Whats most exiting about JB is the teenagefans. I haven´t seen anything like it since Michael Jacksons was on top. Amazing to follow JBs career! Thank you for your great reply. Hope you have a super weekend! 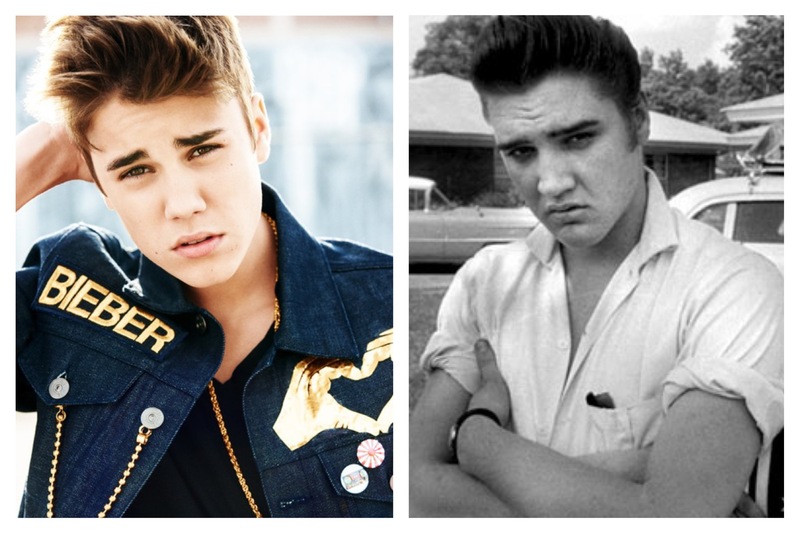 Did anyone stop to think that, just maybe, Justin Bieber is the reincarnation of Elvis Presley??? How do you explain the sheer natural talent they both were born with? Justin Bieber is simply the Elvis Presley of this generation and that’s great to see. Either a Elvis and/or a Michael Jackson for this generation…Without doubt! The thought had crossed my mind also, as I do believe in reincarnation. Ask the kids about who Elvis is and they look at you like a question mark then ask the kids about who Justin Bieber is and they start to scream! I don’t think Justin is only inspired by Elvis, because Justin also looks like and has the same rebellious personality as James Dean had. Thank you for you thoughts! It has to be said, i understand Bieber, and find him doin’ a Miley Cyrus, being young, and standing with one feet in the young world, and another in the grown world. A crash, and he tries to act grown up. Biebers latest “Journals” is a grown up affair, that even grown audience could likt this. When it comes to compare Elvis and Justin, it´s the image likeness i tried to show in this blog post, and by looking at the pics you see the the likeness is there without doubt! Elvis is a legend, and i´ll love him and his music. But remember, grown-ups thought he was kinda nasty at first, with his provocative sceneshows! 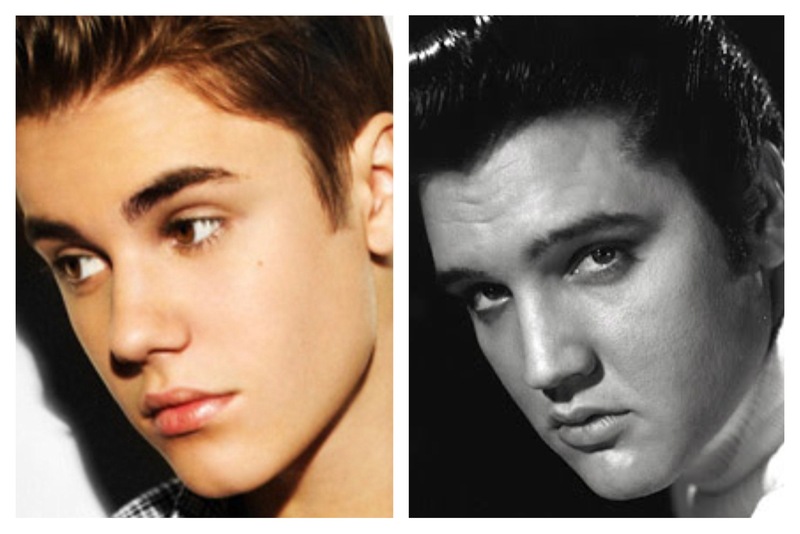 To be honest, Justin Bieber looks like James Dean and Elvis Presley. I agree. A mix of the two. And he seems to know it, or what? I find this interesting, because this is the first time I have seen a celebrity that can pass for two past celebrites, and Justin Bieber really look like Elvis Presley and James Dean. Justin Bieber has a wild and rebellious personality just like James Dean had, and when he sings he leaves an impression on people just like Elvis did, Elvis had a great baritone voice, and Justin sings in a high tone voice, justin has a beautiful angelic voice. Thank you for your reply. Glad you took the time to read this blog post. 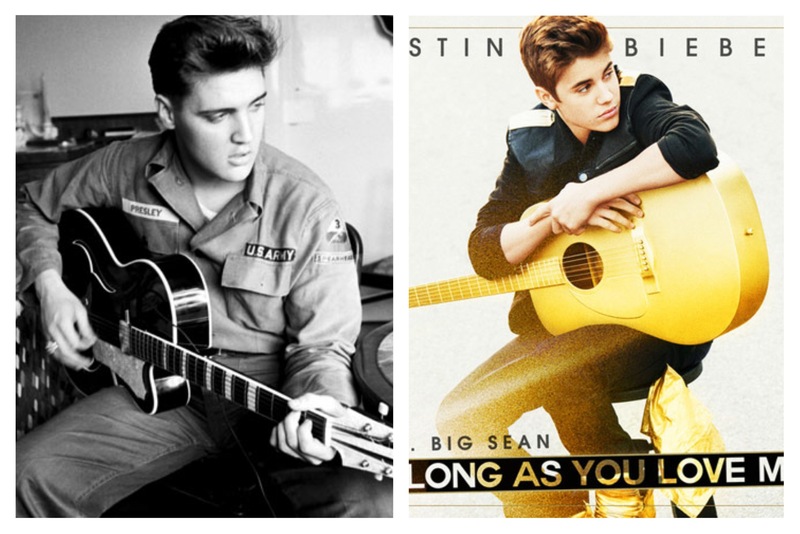 hes not copying Elvis hes just a reincarnation of Elvis this is coming from a huge fan of both.